This digital media boom is driven by a combination of trends and innovations: inexpensive, highly functional digital still and video cameras (even as part of mobile devices); increased network bandwidth; decreased storage costs; low-cost, high-performance processors; high-capacity, solid-state memory; affordable cloud services; and the requisite digital media infrastructure. Navigating all of this digital media creates challenges for consumers and enterprises alike. Consumers want to organize the experience and consumption of digital media files. They want to be able to find them, categorize them, and use them when and where they want – and they want to do all of this across multiple devices. Meanwhile, enterprises and content marketers have a similar but much broader wish list. Of course, they want to be able to find their assets easily, but most often they want to use digital media “products” to reach prospective customers. They may use digital assets as part of a marketing campaign to reach a specific audience in a specific form, such as a digital or physical brochure, an email promotion, a movie trailer, or a website landing page. The digital media could be the product itself – a music collection, streaming television series, video, electronic magazine, e-book, or catalog – distributed in a variety of formats or forms. To produce these products, you need to create, organize, find, and use pieces of digital media: not only the individual images, graphics, photos, video segments, and audio files that form the elements of your product but also the layout, editing, and design files that provide the structure. In most cases, you need to add textual information such as copy, descriptions, and product data as well. Finally, you have to assemble everything together in the right format within the specific production process or workflow. Upon completion, you want to distribute and track all the product components, as well as any changes or versions over time. Additionally (if that weren’t enough), many digital files have restrictions and rights that must be monitored and respected. And this, dear readers, is the raison d’être of digital asset management. Enterprises and content marketers need to manage each piece of the brand story, campaign, or product independently of, or in addition to, managing the whole. This management of digital media throughout its lifetime is the general domain of digital asset management. DAM is concerned with delivering the right content to the right people, on all devices, mostly in real time, with the ability to track and measure digital asset engagement across an enterprise and its potential global reach. Technically speaking, a digital asset is more than just the media file. To realize the value of a file (or collection of files), you need to have additional information about that asset. In short, you need metadata. For most DAM purposes, an asset is defined as the media content plus its metadata. This metadata can be as simple as the name, author, or creation date of the file or as complex as the rights and fees around use of an image or the extracted speech converted to text from a video. Content only becomes a usable asset when metadata is associated with it. Metadata is essential to managing these assets, providing useful information about the content, such as: “Older woman holding a baby, photo, taken by Phil Smith, January 5, 2008.” This information makes content accessible and searchable, provides context, defines usage rights, shows an asset’s history of use, and over time can be used to determine an asset’s value. What do DAM systems do? Though DAM is first a discipline, it’s also a technology. In its simplest form, a digital asset management system provides a secure repository that facilitates the creation, management, organization, production, distribution, and, potentially, monetization of media files identified as digital assets. Like other content management technologies, a DAM system provides basic library services: a common (typically centralized) and secure place to store, organize, and retrieve files. It also provides core process services, including specific facilities for the management, manipulation, transformation, security, movement, and processing of rich media files and their metadata. Most DAM systems can now integrate with other tools and systems, which, for a content marketer, can be particularly useful. No more doubts about whether you’re accessing the correct or latest version of a logo or asset. How does DAM fit the bigger picture? It’s not always obvious. Choosing the right tools for holistic and effective digital marketing is not unlike crafting a complex cocktail: You have to find the right mix of ingredients in the right balance that works for you. What works for one organization might not work for yours, much like one person prefers a martini and someone else prefers a Negroni. Both drinks contain vermouth – just like two organizations might both have DAM systems – but it’s the mixing with other ingredients that means the results can be quite different. As a digital marketer, you need to think of yourself as the enterprise technology mixologist, working with your colleagues to come up with the right mix. While DAM is obviously on your ingredient list, it’s equally important to understand the role that each technology plays, as well as the potentially different priorities or goals other users may have. Otherwise, your cocktail will be a confused mess in a glass, and no one will come back to your bar. How does DAM operate in a digital marketing framework? While the term “digital marketing technology” (or “martech”) is commonly used within the industry, marketers often disagree on what it means. Construed broadly, digital marketing technology is the collection (another cocktail, anyone?) of digital systems that marketers use to gather, cultivate, and nurture leads and customers. Traditionally, these systems reflected how a marketer wanted to represent a brand or product line. However, as marketing becomes (or aspires to become) more customer-centric, marketers increasingly sense that new approaches must focus more intensely on customer preferences – including their browsing and buying history – and meet them in the channel of their choosing (mobile, in-store, catalog, or otherwise). Digital assets are instrumental to realizing this plan. The most obvious example is ad tracking: when someone browses a product on one site only to keep seeing promotions or banner ads for the same item on a different site a few hours later. Not all potential customers appreciate this kind of retargeting as it can sometimes seem like the sales assistant is chasing them down the street after they’ve left the store. But it doesn’t only have to be ad content. DAM technology can assist other systems to personalize the content served to a returning visitor based on their previous activity. Top-performing organizations already recognize that a superior customer experience is intrinsically tied to the quality of their digital channels. And companies that sell tangible products are increasingly and effectively tying together in-store and digital shopping experiences (omnichannel marketing). With the right assets and metadata, and a well-mixed cocktail of DAM and martech, it should then be possible to serve targeted content to prospects and customers alike. At its core, this is the value of DAM: If you’re doing it right, your assets are target ready. They have the right metadata to meet up with the right content and target the customer in the most effective way. And that should make any content marketer’s job easier. A version of this article originally appeared in the February issue of Chief Content Officer. Sign up to receive your free subscription to CCO. 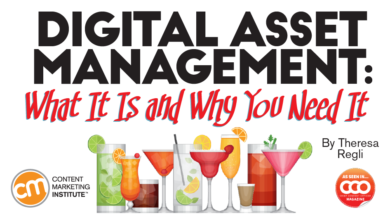 Intimidated by the complexities of digital asset management? Don’t be. Learn in person how to do it well from the presenters at Content Marketing World Sept. 4-7 in Cleveland, Ohio. Register today for best rates and use code BLOG100 to save $100.